Syd has been missing for 22 days, but that’s Syd, right? Syd is a flake. It’s not like he’s dead, right? You don’t think he could…? Syd is, in fact, dead, which you learn within the first ten minutes of this play. Yet, his roommates are a little more concerned with making up his portion of the rent until they realize that all three of them are a little more connected than they originally believed. 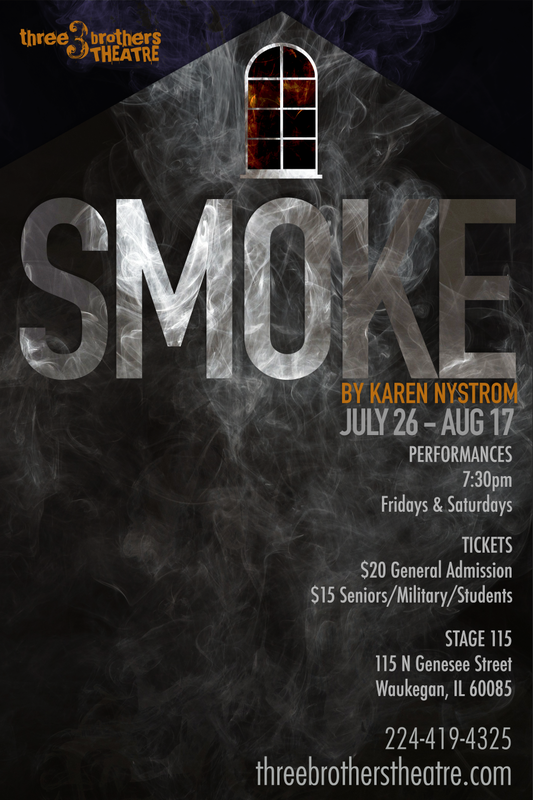 Smoke pokes and prods us to consider how people really think about us. Join us for a meditation about who one person really is. Karen Nystrom is a playwright and poet. She earned her B.A. in English with a minor in Drama from Ripon College, and an M.F.A. in Writing from Vermont College of Fine Arts. Karen is a founding member of the Chicago Poetry Ensemble, whose work was performed at the Green Mill Jazz Club, and other bars, galleries and universities in the Midwest in the late 20th century. She lives in Waukegan and is a past board member of Clockwise Theatre and current chair of Three Brothers Theatre. Jinni Barak is proud to be making her professional directing debut at Three Brothers Theatre in Smoke. Jinni graduated from Nebraska Wesleyan University in 2018 with her Bachelor’s in Theatre & Social Change, where she directed works including F2M, The Most Massive Woman Wins, and her new work The #MeToo Monologues. Since graduating Jinni has been the assistant director for Collaboraction Theatre Company’s Nice Town, Normal People as well as Artemesia Theatre’s assistant director for Reaping the Grove. Jinni is currently the Marketing and Audience Development Assistant at Artemisia Theatre, and is currently working on writing a new play entitled Could You Repeat That? Which surrounds the topic of petit mal epilepsy. Feel free to follow Jinni on social media @jinnilikescats to stay up-to-date on her current work in the Chicago area.